Kay Sprinkel Grace is a San Francisco-based organizational consultant, providing workshops and consultation to local, regional, national and international organizations in case and board development, individual giving strategy, staff development, and other issues related to leadership of the fund raising process. No stranger to the issues confronting the philanthropic sector, her clients include a wide array of arts, education, environmental, social services, and health organizations. 2011-2013 clients include Sustainable Conservation; Mount Wilson Observatory; Archdiocesan Schools of Los Angeles; KQED public radio and television; Detroit Public Television; On Lok Senior Services, San Francisco; San Francisco Symphony; Island Conservation; Sutter Health System; Big Brothers Big Sisters Bay Area; and others. 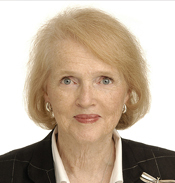 She is a frequent speaker at professional gatherings and in addition to many local and national presentations, in 2013 she has presented at The International Fundraising Congress, The Netherlands; International Fundraising Festival, Prague; Blackbaud Pacific in Sydney; and the AFP Congress in Toronto. On November 6, 2013, she received the Henry A. Rosso Medal for lifetime achievement in ethical fundraising from the Lilly Family School of Philanthropy at Indiana University, Indianapolis. Her B.A. (Communications-Journalism) and M.A. (Education) are from Stanford University, where she has received Stanford’s highest award for volunteer service, the Gold Spike, as well as their Associates’ Award, Outstanding Achievement Award, Award of Merit and Centennial Medal. She is the author of six books related to philanthropic practices and board engagement: Beyond Fundraising (1997 and 2005, Wiley); High Impact Philanthropy (2001, co-author Alan Wendroff, Wiley); Over Goal! (2005, Emerson & Church); The Ultimate Board Member’s Book, (Revised 2008, Emerson & Church); Fund Raising Mistakes That Bedevil All Boards (Revised 2009, Emerson & Church) and The AAA Way to Fundraising Success: Maximizing Involvement, Maximizing Results, published in 2009 by Whit Press of Seattle and Jackson Hole. She contributed a chapter to Fundraising Management 101, edited by Darien Hayman (Jossey-Bass, May 2011) and to MeVolution, edited by Tony Myers and Jon Duchinsky (2012, Civil Sector Press, Toronto). As a volunteer, she also serves on the Advisory Board of the Czech Fundraising Institute and the governing board of Philharmonia Baroque Orchestra. She lives in San Francisco and is passionate about her family, philanthropy, writing, travel and her photography.